The pelvis is the largest bony part of the skeleton and contains three joints: the pubic symphysis and two sacroiliac joints. The sacroiliac ( SI ) joints are strong, weight-bearing synovial jonts. 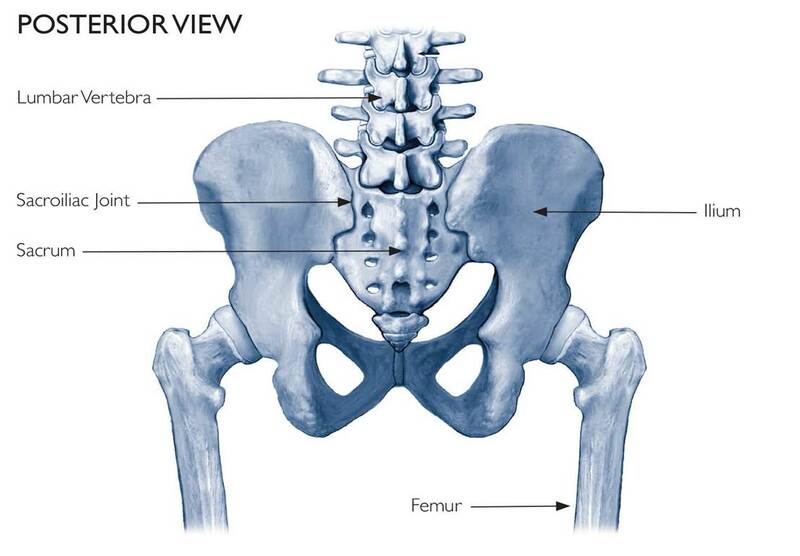 They connect the base of the spine (sacrum ) to the iliac bones on either side of the pelvis. This connection, made through mutliple strong ligaments and muscle, transfers the weight from the upper body down to the legs. The SI Joint is a viscoelastic joint and is not designed for a large amount of motion. The primary purpose for the SI joint is to provide shock absorption and to reduce the amount of stress exerted on the spine. A highly durable network of ligaments surrounds the sacroiliac joints giving them tremendous strength. Minimal movement in Sacroiliac joints ( only 2 – 4 mm ). More movement in women to allow for childbirth. SI joint degeneration occurred 75% of the time in patients undergoing lumbar fusion at 5 years post-surgery. There are a number of treatment options for patients who suffer from the symptoms associated with sacroiliac joint problems. Conservative methods are typically recommended first and may include: physical therapy, chiropractic manipulation, specific exercise programs, and sacroiliac belts. Additionally, oral medications may be used as well as therapeutic injections that my provide some patients a temporary relief of pain. Radiofrequency ablation techniques may be suggested but similar to injections may only provide temporary relief. Surgical intervention may be considered after non-surgical interventions have failed to provide a significant amount of patient symptom relief. Sacroiliac joint fusion provides stabilization of the joint and eliminates motion in the joint, typically providing long-term pain relief for patients. 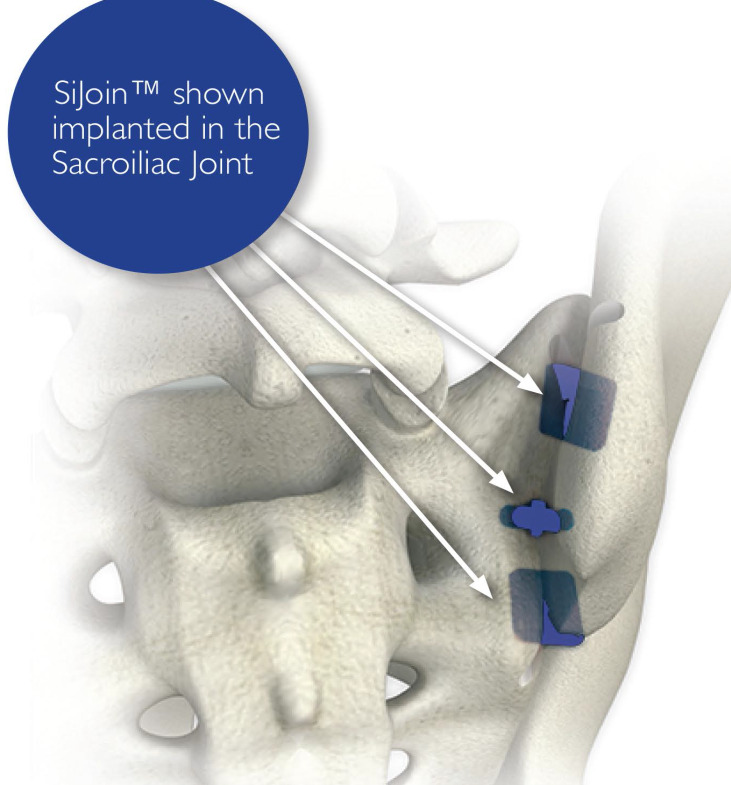 The SI Join™ Sacroiliac Joint Fusion System consists of three Allograft (Bone) implants placed at opposing angles to increase SI Joint stability. The procedure is performed through a posterior approach, decreasing the chance for possible neural complications as associated with lateral approaches. The procedure is performed through three small incisions in the lower back, resulting in lower surgical trauma, reduced blood loss, shorter surgery times, and faster recovery. SI joint procedures have been performed since the 1920’s with positive results, SI Join™ is an advancement on this proven procedure. Less procedural blood loss and less post-operative pain than in order sacroiliac fusion procedures, resulting in faster recovery times. Small in size when compared to other surgical options, while still having comparable strength due to the implant’s patented design. Eliminates the need for bulky metal hardware to achieve stabilization and fusion of the SI Joint. Less traumatic than lateral screw and rod based systems. Joint preparation combined with the allograft (bone) implants enhances fusion across the SI Joint. Deformity that would affect the placement of the SI Join™ implants. There are associated risks and recovery times with any surgical procedure. Please consult your physician for a complete list of contraindications, warnings, post-operative guidelines, and other precautions associated with this procedure. For SI joint dysfunction and pain related symptoms, please contact Dr. Mudit Sharma, Virginia’s leading neurosurgeon and spine specialist.